On July 10, 2018, the SALPN received confirmation from the Minister of Health indicating that the recent proposed changes to the regulatory bylaws related to the Continuing Education Portfolio (CEP) program had been approved. See the frequently asked questions below. Click an item to expand and view more informaton. ▸ What is the Continuing Education Portfolio (CEP) Program? Continuing Education is a mandatory requirement for annual licensure as per the SALPN Regulatory Bylaw 10(1)(b). Continuing Education Portfolio (CEP) hours are accumulated annually by licensed members of the SALPN to improve and/or maintain their knowledge, skills and practice competencies through continuing education. LPNs will utilize the program to self-reflect upon their individual practice and to seek additional education to ensure safe, competent practice. The Continuing Education Portfolio program is now managed in two sections, both are described below. ▸ How do I classify my CEP activities as Formal (Section A) or Informal (Section B)? We have developed an easy to use CEP Placement diagram, see below. ▸ How many hours of continuing education are required for licensure? ▸ How can I obtain CEP hours? Earn CEP hours by undertaking learning that will aid your practice as an LPN. For a list of some available CEP opportunities, please click here. ▸ Can I carry over hours next year? LPNs may “carry-over” a maximum of 8 hours into the next licensure year only. All “carry-over” hours must be applied to section in which they were originally obtained the next licensure year. When audited, LPNs that claim carry-over hours must submit all CEP hours from the previous year, alongside the hours being claimed in the current year. This is needed to prove that the hours being claimed in the current year are in fact carry-over hours. 48 hours in 2018 (24 more than required) = 8 carry-over hours for 2019. If audited, the Member would be required to submit all 32 hours of CEP collected in 2017 and all 16 hours of CEP collected in 2018. ▸ When can CEP hours be obtained? CEP hours are obtained by LPNs from December 2nd to December 1st annually. 2018 CEP Hours - From December 2nd, 2017 to December 1st, 2018. 2019 CEP Hours - From December 2nd, 2018 to December 1st, 2019. Because CEP hours are due at the time of licensure renewal, all LPNS must ensure they have the necessary hours in place by the December 1st deadline to guarantee eligibility. ▸ How long should I keep my CEP hour documentation? LPNs should keep careful record of their CEP hours on their SALPN Member Portal. Uploading your CEP information and proof of completion on an ongoing basis will ensure safe keeping and ease of renewal as the information will be housed indefinitely in the SALPN database. The SALPN Annual Licensure Audit randomly selects members to provide details about the CEP hours they obtained in the previous licensure year (or more if claiming carry-over), so it is important to always know where to locate the required information. 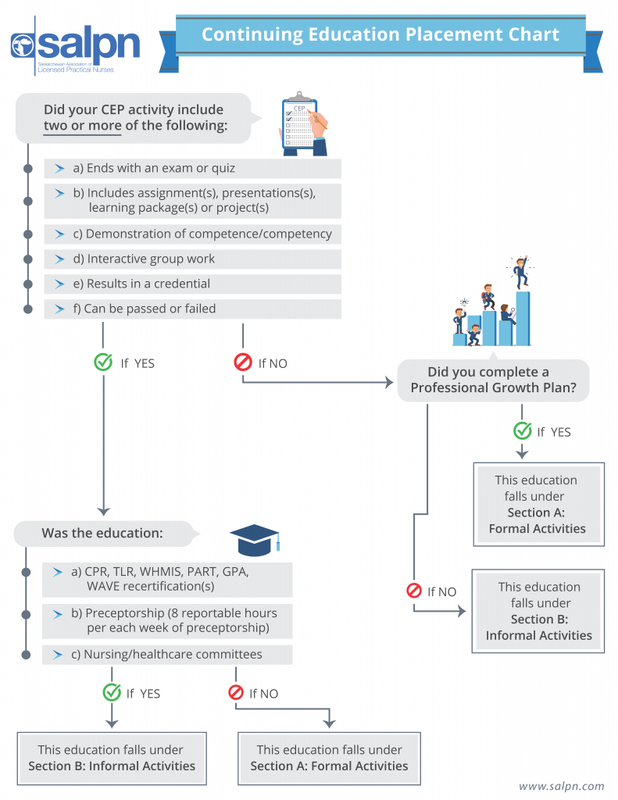 ▸ Can I earn CEP hours while I have a non-practicing certificate? Yes, you can obtain hours while holding a non-practicing certificate. If you return to practicing in the same year, you will be eligible to use those hours towards your minimum requirement. For example, if you were Non-Practicing at the start of the year, attended the SALPN Annual General Meeting in April, and returned to practicing in October, you could use the hours from the AGM towards your minimum requirement.